If the key to happy, hydrated skin is a balance of humectants and emollients (translation: this is why you need serum and moisturizer, not just either or), where do mists and toners stand? I've heard it all when it comes to toner: last step in cleansing, the restorer of skin's pH balance, a more effective base for your skincare routine... They're not necessarily fundamental to a skincare routine, but a nice plus to have, like vitamin supplements in a well-rounded diet. Mists, to me, have become toners-to-go – a quick spritz to save time (and cotton!) while delivering the same effects. They're also great for refreshing your face mid-afternoon, especially in air-conditioner/heater-enabled offices. When I was testing the various sprays in this post, my colleagues never turned down an opportunity for a pick-me-up. Since most face mists are chock full of basically the same hydrating/anti-aging ingredients, the determining factor for which is worthy of your vanity then becomes scent, packaging, price point (you can find face mists from $8 to $80), and personally, nozzle pressure. "It smells like a spa," said not one, but two of my co-workers when I gleefully spritzed this over their faces. I readily admit that I am a spoiled beauty consumer, since this is the first time I've seen a mist with an ingredient list filled with good things priced so low. The packaging is standard white with a stick-on label and the pump is basic (uneven spray), but if you're not a stickler for those things, this is absolutely a steal. The only ingredient in this is, you guessed it, water. This water is purportedly rich in the antioxidant Selenium and is 100% pure natural spring water (bottled in France!). It has no scent. When sprayed, the sensation reminds me of the times I was allowed to stick my head out of the sunroof when my dad drove us through the hilly countryside (humidity levels in Malaysia average 70 to 90%). But, you know, it's just water. 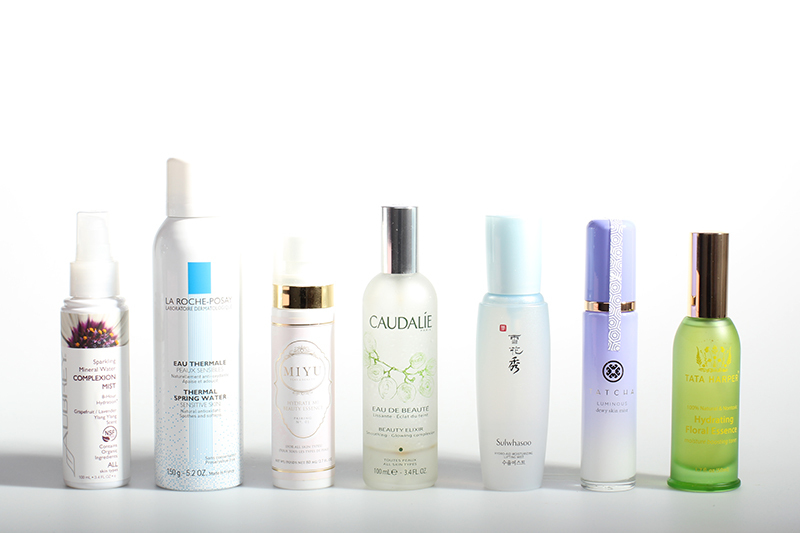 I would say out of all the sprays featured, La Roche-Posay has the best nozzle. You can hold your finger on it and just keep going till the bottle runs dry, unlike the others, which require repeated pumps. I've been keeping this face mist/serum at my boyfriend's apartment for over a year. I use it 2-3 times a week and am finally nearing the end. I wrote a more comprehensive review of it last November, but basically this is a hydrating mist with a light rose scent that could be a substitute for a serum (contains sodium hyaluronate) for people with combination/oily skin. The nozzle spray, however, is not my favorite. It delivers a more concentrated burst of liquid rather than a fine mist over the face if held too close. I have to be sure to hold it 8 inches away from the face for an even spread, but the pressure is not particularly strong so fair amount of product ends up below the chin. To avoid waste, what I like to do with this particular product is spray it into my hands and apply to my face as I would a serum. The writer in me thinks of the scent as a "hint of mint," though this spray is more like a giant wake up call. I use it exclusively in the morning, when everything I do is in service of me resembling a functional human being in a very short span of time. The spray contains a good number of oils, so it might not be the best for those with oily skin. 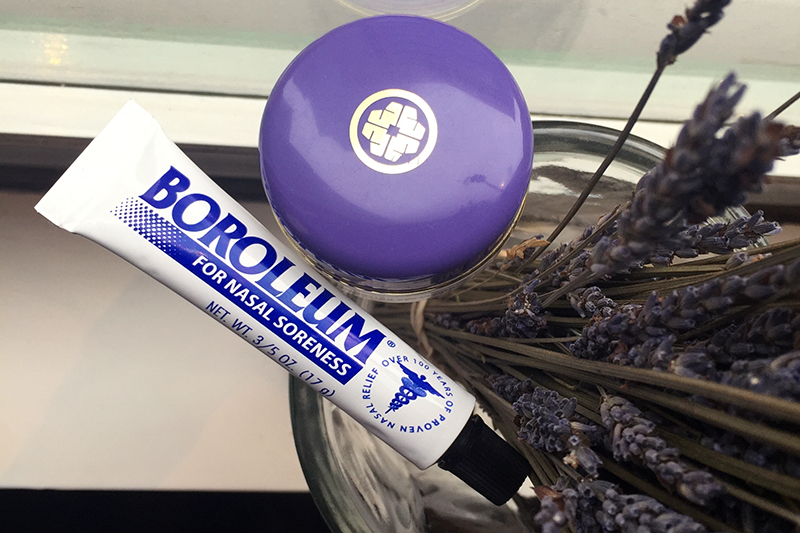 It is one of Lisa Eldridge's favorite French pharmacy products, 'nuff said. If the Aubrey spray smells like spa, this Sulwhasoo one smells like my mother's soup (any association to my mother's cooking, by the way, can only mean good things). Officially, it's a Korean herbal seaweed mist, with two key ingredients purslane and rehmannia that moisturizes and relaxes etc. More importantly, it's a mist that works as it's supposed to and reminds me of my mother's cooking. I giggle at the fact that its use description on the Neiman Marcus website takes into account the very powerful nozzle ("spray at a 20cm distance"), because it really does deliver concentrated bursts of mist. As an aside, while Sulwhasoo continues its expansion in the US, I applaud its commitment to making its products smell like an Asian kitchen, because all my non-Asian friends and colleagues have strong negative reactions to the scents in Sulwhasoo products. A fact I'm sure they're well aware. I must be on my 5th or 6th bottle of this at this point, yet I still took advantage of their recent Friends & Family sale to procure eventual replacements. For the sake of brevity (ha! ), I will link you to my original review and add that one of my favorite uses for this spray is to set makeup. Foundation tends to look dried up on my skin, especially around the edges of my nose, but it takes on a dewy finish with this spray. If you need a luxury point to justify the price tag, it's housed in a beautiful glass bottle (as are the similarly priced Caudalie and Tata Harper sprays) and features an elegant gold pump that distributes the mist in a wide circumference, so you need less spritzes to cover your whole face. Tatcha Friends & Family Sale: 20% off all orders at tatcha.com with code FF2014. Valid through December 7. When I was a child, my mother cultivated organic wheatgrass in black trays outside my house. They looked like mini golf courses. I thought they looked funny, until I realized that my mother intended our family to consume them raw and unadulterated, though (just slightly) mercifully in juice form. I didn't even get to add honey to the drink. I believe we all revolted after a few weeks, and even my mother had to admit that it tasted vile, even if it was good for us. Where was I going with this story? One, I am glad that the organic/natural food movement has come a long way since then. They actually know how to make things tasty now. Two, if I wanted to splurge and buy my mother new skincare, Tata Harper would be among the top of that list. After all, it's so natural you can eat it. Lest I be carried away with superficial associations – natural doesn't always mean good – this face spray contains hyaluronic acid (water retention), witch hazel (controls sebum production), rose and lavender (calms skin and smells good), and I'm only skimming the surface of a seriously impressive ingredient list. Tata Harper Friends & Family Sale: 15% off all orders at tataharperskincare.com with code FF2014. Valid through December 7. It might interest you to know that it's possible to get over-moisturized skin from just face mist, due to countless spritzes while I wrote this post.